One New Aftermarket Replacement Straight Rear Heavy-Duty Drawbar Made To Fit John Deere Tractor Models: 820, 830 (both 3 Cylinder), 1020, 1520, 1530, 2020, 2030, 2040, 2240, 2350, 2355, 2440, 2550, 2555, 2630, 2640, 2750, 2755, 2855, 2855N. Fits John Deere Industrial / Construction Models: 300B, 301A, 302, 302A, 401B, 401C (All SN: 249301>), 401D. (3) 0.781" diameter holes at 1.125", 2.750", & 8.578" from front. Only the 48 contiguous States in the U. 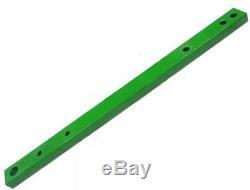 The item "R61126 John Deere Tractor Straight Rear Drawbar 820 830 1020 1520 1530" is in sale since Monday, April 14, 2014. This item is in the category "Business & Industrial\Heavy Equipment, Parts & Attachments\Heavy Equipment Parts & Accessories\Tractor Parts". The seller is "stevenslake" and is located in Williamston, Michigan.